The subway in New York city can be confusing. Fortunately, there are usually natives on the train to give you directions and help you out. It's not uncommon for a tourist to ask which direction the train is going and if the train stops at "xyz" stop. 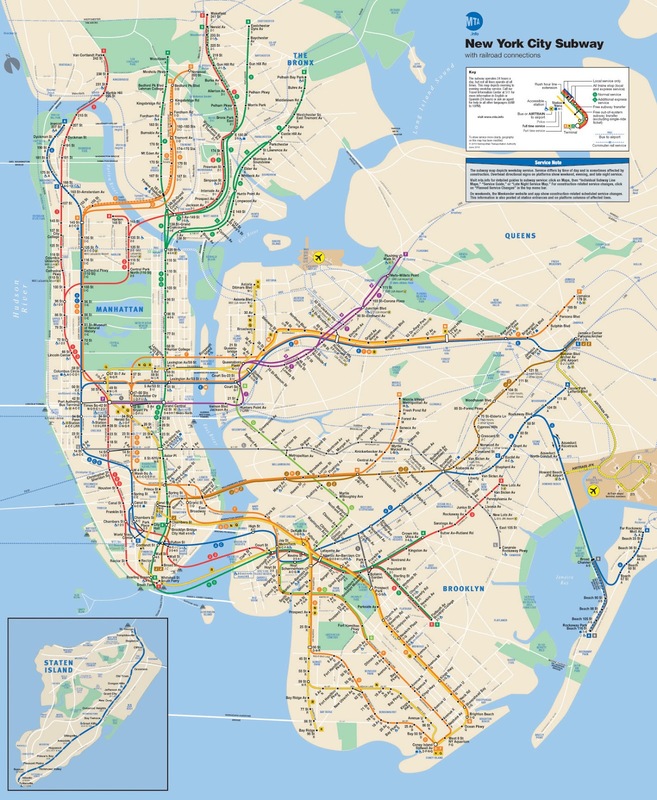 Here's the thing....if you have ridden a subway to work every day and home every day for a few months, you learn to know every single stop along that line and how long it takes to get from there to your usual stop. You learn how many stops between each stop and your stop. You learn which trains connect at each stop because they announce at each one. "This is Jay-Street Metro Tech. Connect here for the A, C, F, and R trains. The next top is Hoyt-Schermerhorn. Stand clear of the closing doors. Ding." You hear this at every stop. You learn it. 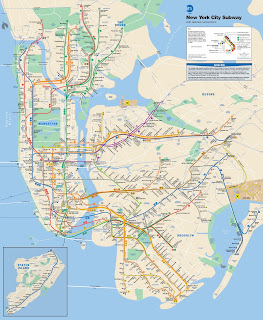 Even though I wasn't taking the train to and from work, I learned the A and C trains to and from Brooklyn between David's apartment and uptown. When I lived in NYC before, I took the 1 or 2 to work and learned those between Wall Street and Midtown. Now I live on an F or G train (Fort Hamilton stop). I'm starting to learn these trains. Here's the thing. Every weekend starting Friday at about 10:00 and sometimes at other crazy times, the city does construction on different tunnels, tracks, and stations. When this happens, trains are diverted to completely different tracks for what can be a long stretch. Also, I've noticed that sometimes trains that might have a 7 on them are being used on a 2 line. When that happens, you are waiting for a 2 train and a 7 shows up. I haven't checked to see if the train displays a number outside or a letter like happens on our trains. Inside, the electronic map says "this map not in service." Last night, I went out with my friend Antuan. My fiance was out of town and I didn't want to sit at home. Afterward, I went to a specialty store to get one of his birthday gifts. I walked into the C and E station near 23rd street. I had planned on taking the E or the C to West 4th to get on my train. I had more than my share of drinks with Antuan and was a bit tipsy. As I walked down the platform, I was calculating the time it would take to get home and holding on to one of the columns. I was looking carefully to see if it was an E or a C pulling up and much to my surprise, an F train pulled into the station. I had to double check to see if I was indeed at the 23rd Street station and not platform 9 3/4. I was confused. I jogged along the side of the train up to the middle where one of the conductors has a little cabin in the train. Was I in a blooper reel or a Harry Potter movie? I asked her if this was a real F train or a fake one? She said it was real. I asked her if it was going where the F train normally goes? She said it was going back on the F track at West 4th. I asked her if she was shitting me? She said no. I said, "Fort Hamilton?...does it stop there?" She said yes sir and then pointed to the doors indicating that I had better get in or she was going to leave me. As I sat in the train I articulated my confusion, fascination, and joy at finding a magical F train to take me home. Only in this super confusing city. My train got me home. Maybe I'll get lucky tonight and a Magic F Train will show up at a stop near my gala :) Bipity bopity boo.